Impact drivers are power tools that are now necessary devices for your toolbox. Have you ever needed to drive nuts and bolts easily or loosen them when they are stuck? Then impact drivers are exactly what you need. They are powerful, efficient and with their various extra features choosing one for your use is harder than ever. To help make the decision easier we have lined up our top three options. As a bonus, we also included a budget pick that will do the job at a fraction of the price. Here are our top picks. The DCF895D2 20V Max XR is DEWALT’s latest impact driver. 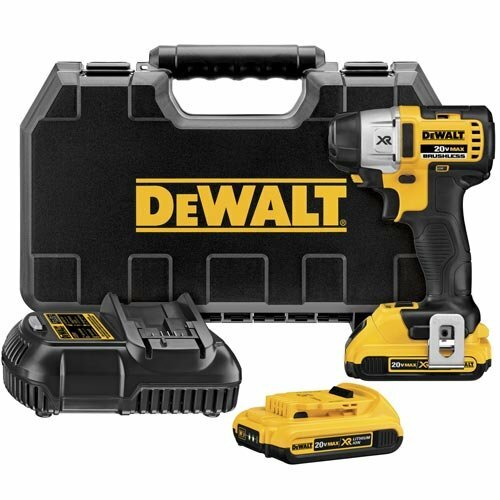 DEWALT, an industry leader in the building of power tools has built this precise and powerful tool. It has more power and better runtime than all its rivals in the cordless and small power tool class. Since it is brushless, its motors electronically have energy transferred within the tool enabling it to work efficiently. This system gets rid of the friction problem caused by the impact driver tools with brushes which in turn reduces acceleration. It comes with two battery packs that allows one to be charging while the other is in use preventing the need for breaks in between charging. Its small size allows its use in confined and tighter spaces conveniently. This tool is handy for drilling jobs since it is more efficient than a normal drill. It’s higher torque makes the job faster and is ideal for both light and heavy jobs. It is best used by woodworkers who are making furniture or installing cabinets kind of jobs. This brushless impact driver is fitted with an all new XR lithium-ion battery. Included is a fuel gauge that gives the best runtime and better performance during the cold weather. The 3-LED Fuel Gauge System gives updates on the charge state immediately. Due to its use of the lithium-ion battery, it provides up to 33% more capacity over the standard packs. The fact that it doesn’t self-discharge increases its runtime capability allowing it to power the tool for as long as you are on the job. This battery pack is light in weight helping to keep the total tool weight down. Additionally, the fuel gauge pack is interchangeable with any of DEWALT’s 20V MAX tools. Its charger is specially designed for detecting problems in the battery. When a problem is detected, the red light on the charger flashes at a fast rate. To solve this, remove the battery pack and insert it once again. If this doesn’t solve the problem try a different battery pack to see if the charger itself is functioning properly. It also has a hot or cold delay. This function stops the charging process until the battery has cooled down after which it automatically resumes charging. This feature also extends the battery life. A push button is featured on this tool that allows the release and change of accessories with ease. This allows one-handed operation meaning that changing of bits can be done with one hand as you move from one function to another. It all means that with this tool pulling off the collar and bit separately is a thing of the past. Three work lights feature at the front side of this tool. Once you press the trigger switch, they are activated and automatically go off 20 seconds after the switch is released. As long as the switch is pressed the light remains on. It is used to light the immediate surface you are working on so it shouldn’t be used as a flashlight. The DEWALT DCF895D2 impact driver has a 3-year warranty that is limited to defects caused by faulty material or manufacturing. Parts that fail due to usual use wear or wrong use of tool aren’t covered. Additionally, this tool is covered with a 1-year free service warranty. This means that parts worn out from normal use are replaced for free after purchase during the first year. If for some reason you are not satisfied with your purchase, you can return it within 90 days for a full refund. As a safety feature, the DEWALT DCF895D2 tool goes to safety mode when the direction switch is slightly touched. While a good feature, it tends to be annoying when this happens often. The Makita XDT01 impact driver uses the brushless motor technology for a better performance and efficiency. 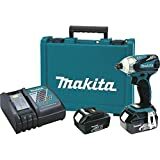 It has a 3-speed power selection that allows the choice of use and versatility in a variety of tasks, from fixing large lag bolts to fastening simple cabinet screws. The 18-volt lithium-ion battery has a fast charge time and holds a charge long enough for you to accomplish your task. The brushless design also assists in conserving of battery, maximizing its life. It is fitted with Makita’s Star Protection Computer Controls that allows communication to the battery for real-time monitoring of conditions. This offers protection to the battery against overheating, overloading and over-discharging. It comes fitted with an LED light that has a switch panel at the base of the tool. When pressed the light status changes from either on or off. When on and the switch trigger is pressed, the light turns on and remains that way during the duration of an operation. When the switch trigger is released, the light remains on for about 10 seconds before going off. If the light’s switch panel is off, even when the switch trigger is pressed, the LED light will not come on. When operational, the status on the switch panel of the LED light cannot be altered until 10 seconds has elapsed after the switch trigger is released. Off: This shows that the battery capacity is adequate and normal operation can be carried out without a problem. Flickering: When the LED light is flickering, it shows that the battery power is almost up and is about 20%. This means that it requires a recharge. On: After the LED light has been flickering for some time without a recharge, it goes on and the tool goes off. This means that the battery is very low and normal operation cannot be resumed until it has been recharged. Also, note that the LED light may flicker even when it has enough charge, this indicates that the tool temperature is higher than normal and should be switched off until it has cooled down. The Makita XDT01 tool comes with a one-year warranty on manufacturer and material defects. Any fault found will result in the repair or replacement of the tool free of charge at the Makita factory or authorized service centers. The charger is optimized with Makita’s technology to charge at record speed enabling more usage and less time charging. This rapid optimum charger is in constant communication with the built-in chip in the battery to optimize battery life by controlling the temperature, current, and voltage in real time. It is also fitted with a fan that cools the battery as it charges for fast and efficient charging. 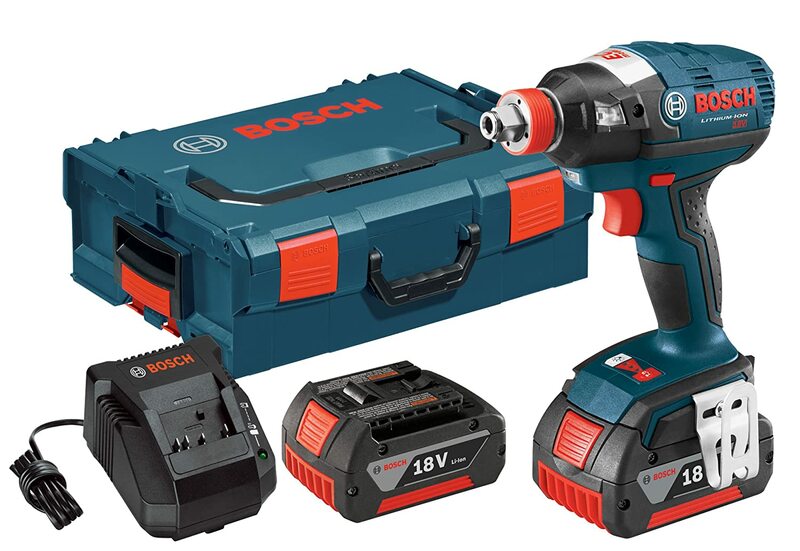 The Bosch IDH182-01L impact driver is a versatile tool that is unique with its socket ready adapter. This adapter is a first in the market, and allows you to seamlessly change the screwdriver bits from ¼ inch to ½ inch. This effectively does the job of two tools and prevents the use of socket adapters that constantly break. This innovative solution makes it an ideal device. Along with its predecessors, it features the brushless motor design that makes for a stronger motor and less power consumption. This motor is superiorly efficient and doesn’t require any maintenance. To help increase the battery life, it is fitted with intelligent electronic cell and motor protection. The speed and torque of this tool are easily adjustable for maximum or less power depending on the use. Its grip is made with a small diameter to reduce operator fatigue or discomfort. To illuminate the work space, three LED lights are used. It features cool pack technology that keeps the battery cool and thereby extending its life through the use of its heat conductive housing. With this tool, you can vary the speed applied simply by pressing the trigger switch. Once you press the trigger switch, the tool is on, and to increase the speed apply more pressure to the trigger. Decrease by releasing the pressure to the trigger. Built-in on this tool are three LED lights that give better visibility when working in poorly lit areas or at night. They are automatically turned on when the trigger switch is pressed and turn off 20 seconds after release of the trigger switch. If you want to turn it off manually, there is a switch at the base of the tool. To keep your bits in a convenient and easy to reach place, there exists a storage area in the handle base for you to keep them. This keeps it to be in a handy area for you to use and avoid misplacing. When working in hard to reach areas or in many different areas, you may need to carry your tool in a convenient manner. The Bosch IDH182-01L allows you to attach it to your belt using its belt clip. This also prevents it from falling or causing injury to yourself or anyone around or below you. When climbing a ladder clipping it to your belt will give you the chance to use both hands. To use the clip, turn the tool upside down and attach it to your belt. It can be fastened on either side of the tool using a mounting screw, but always make sure you tighten the screw before using it. This Black & Decker BDC120C impact driver doesn’t have the kind of features that the top three tools have, but for the price you pay, you can’t complain. It is ergonomic and built with the best quality materials, which betray its low price. It features a compact and lightweight design for ease of use, and its high-performance transmission delivers a maximum torque of 1,375 inch pounds. This impact driver is perfect for any DIY project you have around the house, but for professional jobs, check out the other pro tools. At only 3.6 pounds, it is easy to work with for extended periods without causing fatigue to you. This compact and light driver is powered with a 20-volt battery and has a quick release ¼ inch hex chuck. Given its compact and light nature, operating under surfaces that may require you to do a lot of maneuvering is easy. 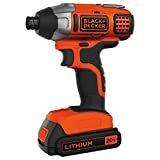 The Black & Decker BDC120C impact driver only comes with one lithium-ion battery so while the battery is recharging, you will have to wait to use the tool again. This tool features a 2-year limited warranty as long as you use it in a home environment. The warranty covers factory defects in workmanship and materials. A defective product will be exchanged for another one if it is within the time period of exchanges or taken for repair at an authorized service center. It offers variable speeds that operate between 0 and 3,000 rpm by pressing the switch trigger. Press the trigger switch for increased power and release for less power. Doing this gives you full control over how much power you require for a particular job. A quick release chuck for its ¼ inch hex allows for easy swapping of drill bits. For those who already own other Black & Decker 20V MAX tools, their batteries are interchangeable and function well with each other. So if you have the 20V MAX drill you can use it with this impact driver. This works well for people who love Black & Decker products and own many of them allowing them to have multiple batteries to use. It will also allow you to buy future products without the battery pack, which will help you save money as well. This Black and Decker BDC120C impact driver doesn’t have an LED light, which is a huge disadvantage when working at night. Buy an LED flashlight for operating in poorly lit or dark areas. It is also missing a belt clip, which makes it hard to carry and move around with. At half the price of its above counterparts, it’s a small price to pay for generally good performance and power. Most power tools you buy come with warranties. For impact drivers, select one that has the longest possible warranty. This is because they might have some faulty material or workmanship defects. Faults or wear and tear are also bound to occur due to constant use, so having a warranty that is at least 2 years is ideal. Some models even come with a 1-year free service warranty and replaces worn out parts too. Be on the lookout and get the most out of the warranty offered. When using an impact driver on a job, you need to see the work surface clearly. Tools with built-in LED lights should be considered. Other times, you might be working late in the day and into the night. Having an LED light gives better visibility at these times and enables you to get the job done right. Though this might seem like a small matter, when on the job, it is critical for you to have proper lighting available. Using an impact driver will see you working on various kinds of surfaces, from wood to concrete. Hard surfaces will require you to use the tool with force. The driver’s housing should, therefore, be made of strong material and should be stable when used. Impact against a concrete surface should not damage it. Do not go for light plastic housing which can easily break down due to the rotational force. Additionally, the stable housing should also not be too heavy for regular or extended usage. Impact drivers are held in your hand whenever you need to use them. Having an ergonomic design that is easy to handle when using is important. For tradesmen who need to use them on a daily basis, the tool should be comfortable in their hands. With the many different sizes and shapes, select one that is right for you. If you need to use an impact driver in a tight space, it should be small enough to fit into the tiny nooks. The tool should also have a rubber kind of handle that prevents it from slipping. Pick it up in your hand and test out how it feels and works before you purchase. Using one hand when operating a power tool is what most people are used to. The impact driver you purchase should have a handle that is short and comfortable for one-handed use, which allows for easy handling. The reason why people buy impact drivers is to drive bolts and loosen them when needed. Depending on the work you want to use these tools for, the force required will vary. Torque is the amount of force used to twist a nut. If you need the tool for heavy duty work, make sure you select an impact driver that has a lot of torque for that operation. Measured in inches per pound, the general rule is the more the torque the stronger the tool, and the faster it works. Now that we have made your job a bit easier, choose one that is ideal depending on the purposes you need it for. Knowing the exact reason you require an impact driver is the first step in selecting one. By examining the various types we have listed, pick a model and enjoy the amazing benefits it can give. When assembling the tool or performing any maintenance or checks, make sure that it is switched off and you have removed the battery pack. Safety goggles or other eye protection devices should be worn in case of flying particles also. In order to prevent any injury, make sure you observe these and all other safety requirements before, during and after use.